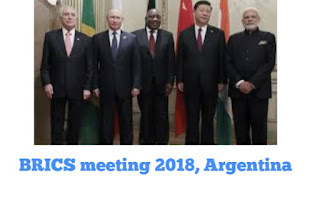 BRICS formal meeting of 2018 recently concluded on november 30th in Argentina. It was important meeting where trade war, Paris agreement on environment issue are duscussed. 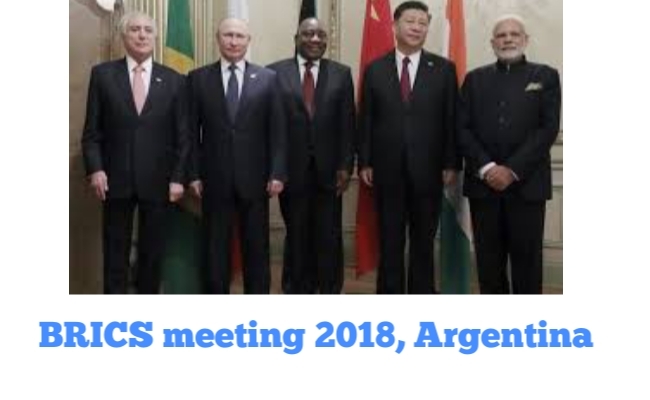 See more detail below…..
On November 30 the head of Brazil, Russia, India, China and South Africa met for the annual informal BRICS leaders meeting on the margins of the G20 summit in Buenos Aires, Argentina. Brazilian president Michael Tenner, Russian president Vladimir Putin, prime minister Narendra Modi, chinChi president Xi Jinping and South African president Cyril Ramphosa attended it. BRICS country consist of 42% words population and $18.25 U.S trillion worlds GDP which is 23.2%. BRICS nations have agreed that full support should be given to the rules based multilateral trading system which will be represented by i(WTO) and to non-discriminatory, transport, open and inclusive international trade. At this time we know that trade-war is going on openly and WTO has important role to play in it. IMF has also warned regarding trade-war that it will hit US and Chinese growth in 2019. BRICS Countries are agreed to strengthen multilateralism, strive for international order that is fair, just, equal democratic and representative element in in the morning United Nations 2030 agenda for sustainable development and also for Paris agreement on climate change. As we know Donald Trump said Paris agreement is against US. The BRICS nations will also focus on to strengthen their partnership’ and implementation in the achievement of their corporation such as on new industrial revolution. BRICS Countries looking forward to the 11th BRICS summit to be hosted by Brazil in 2019 and extend our full support to Brazil as the incoming BRICS chair. We call upon all Countries to reach a balanced outcome under the Paris agreement work program during COP-24 that enables operationalization and implementation of the Paris agreement. BRCS stressed the importance and urgency of conducting a successful and ambitious first replenishment process of the green climate fund. So in this way BRICS formal meeting 2018 concluded with overall the meeting went against USA.